Last year, the National Football League faced perhaps the worst public-relations crisis in its history. Even those who couldn’t care less about football knew all about the league’s disastrous handling of a domestic violence case involving Baltimore Ravens star Ray Rice cold-cocking his future wife inside an Atlantic City elevator, then dragging her unconscious body into a hallway. Even as public outrage focused on Rice, though, the league and commissioner Roger Goodell were quietly dealing with an even more appalling and even less ambiguous domestic violence scandal featuring another All-Pro player, if one that got far less attention. It wasn’t until well after the Rice scandal had come, gone, and devolved into an image-rehabilitation tour, though, that the commissioner even laid down his verdict on Greg Hardy, issuing a 10-game suspension that was later, inevitably, reduced to four. What happened? As with the Rice case, which changed the face of the NFL after TMZ published video of him attacking his fiancée, this one was largely about the visuals—in this case, a set of photographs said to show that Hardy’s attack on his girlfriend was every bit as bad as police reports suggested it was. The difference was that they never came out. The NFL acquired them, though, and the process by which they did says a great deal about the way the NFL operates in the post-Rice era. In public, the league claims that its main interest is in justice; in private, its actions suggest an intense desire to avoid being humiliated—or surprised. When Hardy, a defensive end then with the Carolina Panthers (and now with the Dallas Cowboys) was arrested in May 2014, it was immediately clear that the case had the potential to be horrific. 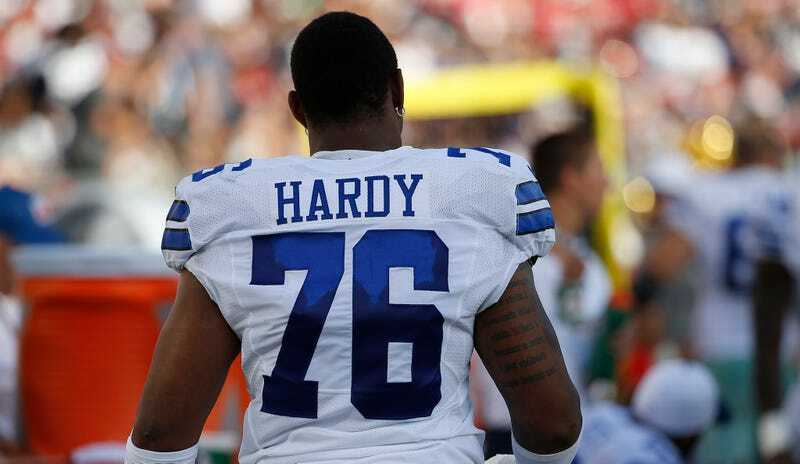 Hardy’s girlfriend, Nicole Holder, said in a filing for a restraining order that he had choked her, threatened to kill her, slammed her against a futon, and tossed her onto a couch covered in guns. There was a witness who heard Holder yelling, and there was evidence: Holder’s medical records, a list of weapons recovered from Hardy’s home, and dozens of photos of Holder’s injuries. Holder testified in court, saying, “I was so scared I wanted to die.” Mecklenburg County Judge Rebecca Thorne Tin found Hardy guilty last July, though the verdict barely registered amid the summer of outrage after the NFL’s serially botched handling of the Rice case. North Carolina law allowed Hardy to immediately appeal the verdict and ask for a new trial, this time with a jury. The second time around, Holder refused to testify, reportedly after Hardy paid her in a settlement. This past February, the charges were dropped. Now Hardy was a free man, and the case nobody had paid much attention became a storyline unto itself. After the Rice fiasco, Goodell promised to get tough on domestic violence, unveiling a series of harsh-sounding punishments (that still left him plenty of discretion) and vowing to create an armada of NFL investigators to suss out the truth. It was great PR, but could he actually pull it off? To decide how to discipline Hardy, the NFL decided that it needed to see photos of Holder’s injuries, photos that weren’t part of the police file. (A non-law enforcement source gave them directly to prosecutors, complicating the question of whether they are public records). This NFL request to see them came despite the fact that the league had already been granted access to other photos in two separate police files. As in the Rice case, the NFL knew the facts—a woman said a player beat her up, and nearly all the evidence backed her claim—but appeared reluctant to believe her without every possible visual confirmation. Perhaps the NFL wanted to be thorough; an at-least-equally likely explanation is that Goodell wanted to make sure his ruling wouldn’t make him look bad if these photos got out. What follows is a glimpse at those negotiations, via emails obtained through a public-record request made to the D.A.’s office. The emails don’t give every twist and turn of the talks—some refer to phone calls at which unknown details were discussed—but they do offer insights into the real workings of the NFL investigatory apparatus. Despite Goodell’s mantra that the NFL “can no longer defer entirely to the decisions of the criminal justice system,” this investigation, in truth, was highly reliant on that system. In trying to lay hands on the potentially damning photos, the league had nothing more than what an everyday blogger has at her disposal: harsh words and public-records requests. A league known for its deliberate impenetrability draped itself in the language of openness and transparency. But because the NFL doesn’t actually care about those things, it disavowed them within 24 hours of the district attorney demanding full secrecy as a condition of granting access to the pictures. What the Washington Post called the NFL’s “intricate and largely secretive three-layered security force” last year comes across, yet again, as rather useless. For all its pomp and flowcharts, in practice NFL Justice looks more like a bunch of schmoes with Park Avenue addresses asking nicely and hoping the law breaks their way. This past May, I asked for all email communications between NFL people and R. Andrew Murray, the Mecklenburg County district attorney, and Jamie Adams, the assistant district attorney and prosecutor on the case, over a period spanning May 13, 2014 (the day Hardy was arrested) to April 7, 2015 (the day after Murray’s office announced its agreement with the NFL). No emails spring up until Sept. 12, 2014, close to four months after Hardy’s arrest. That’s when Murray signs two formal letters addressed to Jerry Sennett, a former Charlotte-Mecklenburg deputy police chief turned NFL security representative. An email earlier in the day describes these as “the two separate letters that Jerry requested.” One outlines the legal machinations playing out in Charlotte: Hardy was found guilty by a District Court judge, but state law allowed him to immediately appeal to Superior Court, at which point “it is as though the District Court conviction did not occur.” The second outlines various scheduled court dates. Sennett responds quickly to Murray’s deputy and sounds pleased. The emails go quiet again until Feb. 11, 2015, two days after the charges against Hardy were dismissed. Lisa Friel, now the league’s senior VP and special counsel for investigations, sends a formal letter to the D.A. asking “to arrange a meeting with appropriate people in your Office to discuss this matter.” (If Friel’s name sounds familiar, it’s because she was among the specialists brought in post-Rice case to help the league “get tough” on domestic violence.) They meet, after dealing with a flight delay, and she follows up with another kind note. None of these emails get the NFL the photos it wants. The league had reviewed the investigatory file from the Mecklenburg County Sheriff’s Office and Charlotte-Mecklenburg Police Department, but those reports were missing the seven photos that weren’t given to the police. Nothing in the emails discusses about how hard the NFL tried to get them from Hardy’s defense attorney—although the Charlotte Observer once noted that the player’s lawyer, Chris Fialko, was “protecting his client’s interests”—or track down the person who gave them to the D.A. Maybe they tried; maybe they didn’t. Either way, in these conversations, the NFL appears to believe that its investigators are entitled to these photos. It’s not going well. Requests made directly to Murray’s office are denied; a court motion asking to have the evidence unsealed fails; and on March 11, a Charlotte lawyer working for the NFL, H.M. Whitesides, writes to Murray saying they are prepared to sue for the records. The letter goes on to quote various pieces of case law that support the NFL’s position and lays out the league’s upcoming strategy, somewhat mimicking the deal it cut with the police: Give us what we want, and we promise we won’t show anyone else. To be clear, a protective order in this case is a fancy legal language for a non-disclosure agreement. This is an argument any journalist can love. There’s still a certain irony in Roger Goodell’s NFL—where evidence of cheating is destroyed, a child abuser is exploited for brand management, and lies are told in favor of statewide laws to save billionaires even more money—accusing others of not practicing transparency. On March 25, one week after the suit is filed, there are emails about setting up a conference call to include Friel, Whitesides, and Murray. The next day, after the scheduled conference call, Whitesides files a motion to cancel a hearing regarding the league’s lawsuit; an hour later, Murray writes to Whitesides, saying, “you should be receiving Melissa’s draft soon.” Melissa is Melissa Trippe, a deputy attorney general in North Carolina. She’s involved because it’s the North Carolina Department of Justice that will represent the DA’s office in such a lawsuit. The next flurry of emails, from March 27, are about setting up a meeting at Friel’s midtown Manhattan office. It’s set for the coming Thursday and will include Friel, Murray, and a “Dr. Hirsch,” a person that isn’t fully identified in the messages. There’s some chatter about logistics, and then Friel has a question about the exhibits. Murray is less enthused and says there is one deal breaker that they must address before he will go to New York. Murray sent that email at 7:03 p.m., two hours after Whitesides sent Murray and Trippe a draft of the stipulated protective order that would give the league access to the pictures. The “deal breaker” is even suggesting these might be public records. The NFL went into this arguing that they had a right to the photos under the state’s public records law—the same law used every day by reporters and citizens who want to find out what public servants are actually doing. In doing so, the NFL was touching on an important question with no right or wrong answers that jurisdictions across the country grapple with every day: How to weigh sensitivity to victims and their families against the importance of an informed public? This is the NFL, though. The public records issue, for them, is just a wedge to get what they want. They don’t care about social justice or an informed public. They care about making sure Roger Goodell doles out a punishment that will look good if the photos leak to TMZ or Deadspin. This was not the Ray Rice case; there was no question of what went on. The only question was how bad it might look to the public. Justice is just an excuse for getting the optics right. Why Does The NFL Need To See Photo Evidence Of Greg Hardy&apos;s Abuse? Whitesides sends this to Trippe and Murray late Friday, and a little less than two hours later, Murray emails Friel saying this could be a deal breaker and to not even bother booking that trip to New York. The “interest of compromise” is now the “interest of justice.” Meanwhile, there is some additional interesting language about the “nature of the conduct involved” and “unique factors present in the situation.” This sounds impressive, but doesn’t quite fit the facts at hand. There’s nothing out of the ordinary about the “conduct involved”—domestic abuse happens every day in America. There don’t seem to be any “unique factors” other than the NFL being, well, the NFL. The question about if these are public records—a document so important the public has a right to see it—is not only removed but flat-out refuted. By the terms of this agreement, everyone involved stipulates that these “are not public records,” meaning that you and I have no right to see them. But, curiously, the NFL—according to both the NFL and Mecklenburg County prosecutors—does. The end result is that in a matter of days, we’ve gone from a lot of talk about public records and transparency to something completely different—the NFL enjoying the unique privilege of being able to review non-public records for the sake of an investigation into an employee’s conduct outside the workplace. So much for the public’s right to know. The motion is filed in court the next day, April 1. Murray’s office puts out a press release five days later. On May 5, Goodell signs this. If Hardy were an employee covered by another union—say, one representing autoworkers or schoolteachers—and his employer asked for these photos, would Murray have given them over, “in the interest of justice?” In a statement he later issued, Murray all but says no. His explanation? The NFL, specifically, needed these photos to dole out discipline. The DA’s Office allowed the severely limited use of these photographs because the NFL agreed to keep the photographs confidential and demonstrated its need for the photos in a disciplinary hearing based on the same conduct that was the basis of the criminal charges that involved alleged domestic violence. In the eyes of the law, he says an organization like the NFL is no different to a private company entitled to limited informal in a criminal case. Laughrun says agreeing to unseal records for a certain entity, opens the floodgates on who should be entitled to such information and it sets a dangerous precedent. In this case, Big Brother won. When the NFL announced a 10-game suspension for Hardy, it boasted about “an extensive two-month NFL investigation,” then watched as the NFL media did as expected, drowning Goodell in laurels and declaring that “justice was served.” Never mind the arbitrator who later would reduce the suspension games to four or the difficult questions left in its wake about the right of any employer to access restricted information about an employee’s actions outside the workplace. As the calendar turned to the NFL season once again, Goodell was able to convince America that NFL Justice was real. That’s all that ever mattered.